So election day came and went with very little changing, for all the hubbub. National is a bit stronger, and no doubt emboldened by success. Labour is a bit weaker, and will now be focussed on blame and bloodletting. The Greens are probably feeling in pretty good shape, but are likely puzzled at the apparent drop-off in support on election day – again. It’s hard to say whether it is some unknown systematic polling bias or whether people get cold feet once they get an orange marker in their hand. More significant are the changes among small parties. The loss of Hone Harawira from Parliament is a major blow and only time will tell whether there is any life left in Mana. If it really intends to be a movement rather than a political party, as its supporters claim, then this might be a blessing in disguise. It is almost impossible for a genuine political movement to coalesce out of a political party, rather than the other way round. The Maori Party has survived and if it can find a way to heal the deep rift caused by the expulsion of Hone Harawira and make room for mavericks within the party, it may be capable of rebuilding itself. I always thought the best strategy was to keep people like Hone inside the tent, free to say the things the leadership couldn’t say. ACT was mortally wounded 3 years ago after making John Banks their leader – and that was before the scandals. The party is still alive albeit on an iron lung. It’s hard to imagine David Seymour, or Jamie Whyte as out-of-Parliament leader, making enough impact to lift party support much. The only question is how long National finds it convenient to keep the life support plugged in. Nothing much changes for New Zealand First, although having Ron Mark back will help it look less like a one-man show. The extra votes that Winston now wields will mean little. Overall, then, people voted for more of the same and they are going to get it. For progressives, this is a lost opportunity. It means another three years before anyone even begins making the kinds of infrastructural changes needed to become a 21st century nation. It means that at a national level a number of indicators are going to keep getting worse – from poverty levels and inequality gaps to worsening environmental quality and loss of ecological integrity. It means another three years of embarrassment on the international stage, as we continue to drag the chain on climate change and spy on our friends on behalf of the Club of Five. All masked by growth rates that sound adequate but are largely meaningless when it comes to the real state of the economy. So I was a little taken aback at the outpouring of grief on my Facebook page. Many of my friends and acquaintances seem shell-shocked by the election result. Their responses range from disbelief to anger. 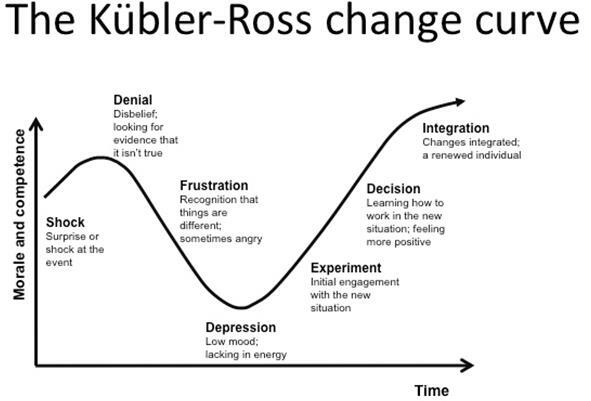 It is like looking at a classic Kubler-Ross model of responses to grief. I thought I’d show a diagram so that people can understand the process they are going through and see that there is light at the end of the tunnel. Stop assuming national voters are all selfish and greedy – they may well have voted for National because they simply didn’t believe a Labour Green Government had, or could deliver, the solutions. On the other hand, in the interests of not looking stupid, my advice to all the right wing media commentators is to stop saying that David Cunliffe should have criticised his team, his campaign strategy and himself in his election night speech. There is plenty of time for Labour to look at what it is doing so spectacularly wrong, but election night speeches conceding defeat are for thanking the team for trying, not attacking them for failing to win. Having said that, there are a few glaring faults that Labour needs to rectify if it wants a shot at leading a Government in three years time. Labour needs to stop fighting itself and its allies. I won’t go on about the internal self-sabotage because it is so obvious as to be painful, but Labour really needs to learn to play with the other kids. Writing off working with Internet-Mana was stupid. It says that either Labour will probably be unable to form a Government or that, as Hone intimated, they are lying. John Key was not sullied by either the puppy love of Colin Craig or the more bizarre shenanigans of John Banks. He even got away with picking the lock for both Banks and David Seymour to break into the House, without it reflecting badly on him. He just looked pragmatic. Why then did Labout panic over Internet Mana? The billboard change-outs that said “only a vote for Labour will change the Government” was equally stupid. It was patently untrue for a start. If people thought it was true then the implication was that there was NO WAY that Labour could be the Government since it was polling in the thirties. It was just another sign that Labour had forgotten how to put coalitions together. There is no doubt that there was media bias in the campaign. The last poll reported in the Herald showed a drop in support for National, but was reported as showing a jump in support, based on some shoddy and invalid statistical manipulation. That sort of media bias needs to be jumped on pretty smartly. Nevertheless the big problem wasn’t the media. It was the campaign. David Cunliffe did really well when he had the chance. He certainly looked like John Key’s equal in the leaders debates, but that was never going to be enough in the context of a weak campaign that was full of blunders. Apologising for being a man was probably the most ridiculous thing to come out of the mouth of a political leader for some time. Drawing lines in the sand over things like cannabis law reform, which is supported by a majority of the population and his potential allies, was unwise and unnecessary. He could easily have fudged the issue to give himself some room. Finally, the impact of ‘Dirty Politics’ and Kim Dotcom. I have huge respect for Nicky Hagar and his work but in hindsight, releasing the book during the campaign was too cute. It looked like a stunt. It would have been better for Nicky to have released the book earlier in the season to allow the issues to be investigated and the shine to be taken off Key without leaving himself open to the accusation of trying to hijack the election. Given the careful persona Key has cultivated for so long, people probably needed a bit of time to assimilate the new information. Bringing it out during the campaign seems to have just locked in people’s opinions, for or against Key. The decision of both Hone Harawira and Laila Harre to link themselves to the Kim Dotcom train was always going to be a high risk gamble. Whatever else you think of Kim Dotcom, it became apparent early on that he is a loose unit with no political sense. The best thing at that stage would have been to kept him well out of the stage lights. I suspect that would have been hard to do. I have no doubt that he is a strong willed guy with a ego to match the size of his bank balance. Nevertheless if Internet Mana wanted to be taken seriously as something other than his toy, he needed to stay in the background. Allowing him to hijack both the launch (by publicly hinting he hacked Slater) and the Moment of Truth (with the email about his personal fight with Key) was unwise. So, lets look at the silver lining. Lots of people are now motivated to ensure Key doesn’t get a fourth term. This is a good time to harness some of that energy, not for political party work but for building a genuine constituency for change. The thing that will ultimately define the shape of New Zealand is not politicians but the expectations of its citizens. When there is a broad movement for a socially, ecologically and financially regenerative transformation, then the political parties needed to support that will be elected into Government. But be warned – we are a long way from being able to deliver a compelling vision of the future.